Philips has announced a series of automotive showroom projects in upscale auto dealerships across Russia that combine LEDs in a fine mesh with textiles and intelligence that allows dynamic presentations in the retail lighting application to wow customers. The luminous textiles will finally be installed in all 45 Russia Lexus showrooms, and the project also includes intelligent control of ambient solid-state lighting (SSL). Philips has long been a supporter of the concept of using textiles as a medium to integrate lighting. As we covered in a feature on the Light+Building 2014 trade fair, the company demonstrated a textile luminous ceiling called OneSpace. The product uses a fine LED mesh and enables architects to specify lighting as a building material. But Philipswork with textiles goes much further back. In 2006, we first covered the companys work in luminous textiles and what the company then called Lumalive. The automotive retail lighting project combines connected lighting technologies and the luminous textiles. 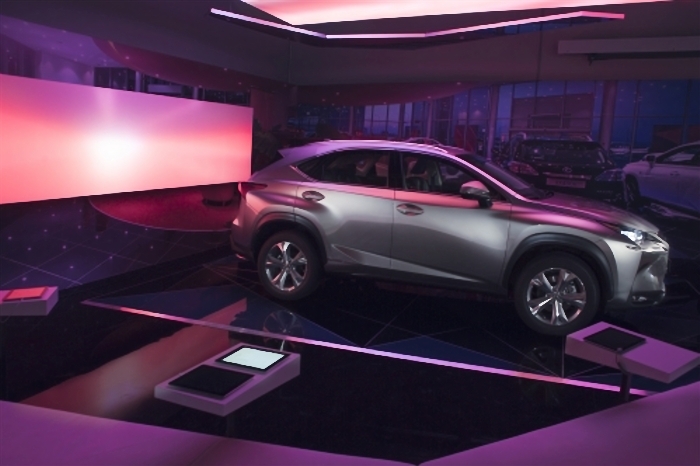 Lexus has installed the textile panels above cars in the presentation area of the dealership, and uses the textile panels to project dynamic content and colors. The color spreads reflect on the polished car surfaces and on the mirror-like surface of the showroom presentation platform. The SSL installation, including the textiles and ambient lighting, can all be controlled via a smartphone or tablet. Lexus considers the LED-based showroom lighting a competitive advantage as the retail lighting impacts customer behavior in ways beyond simply lighting the automotives. The dealerships will use the SSL installation to essentially guide customers through the showrooms, enhance brand identity, and finally to increase sales. "We are proud to work in cooperation with one of worlds leading car manufacturers," comments Berno Ram, head of lighting applications for Philips in Russia CIS and Central Asia. "Philips supports its customers with connected lighting systems that bring business competitive advantages and enhance their brand impact. Our connected lighting system with luminous textiles stresses the futuristic design of the new Lexus NX, showing the car in the best light."